American goldfinch in front garden. Photo by Donna L. Long. 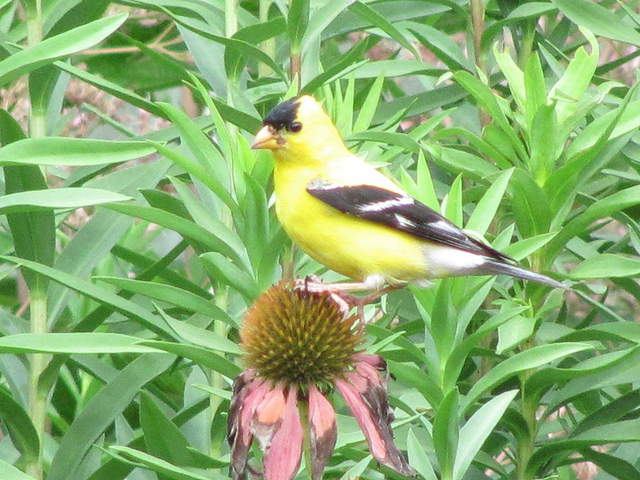 American Goldfinches are picking the Purple Coneflowers clean. Purple Coneflowers are excellent native plants to attract colorful Goldfinches to the garden or backyard. I was weeding the library garden when two American Goldfinch males entered the garden with their fast, bouncy undulating flight. They began to tell me in excited voices that I was in their way. As soon as I moved, they perched in the witch hazel trees and scanned the area for danger. 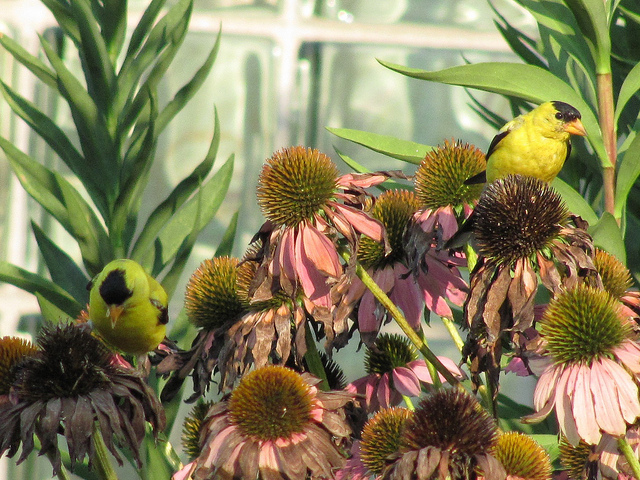 Then they swooped down to perch on the coneflower stalks and began the business of picking the seed heads clean. For the past few weeks the Goldfinches have been visiting the garden early in the morning and heading straight for these plants. These bright yellow birds are finally in their nesting season The other songbirds have raise a brood or two and are getting ready for the long winter or migration ahead. But the main food sources of the American Goldfinch nestlings are just beginning to come into abundance. Summer flowers are maturing and producing seedheads. 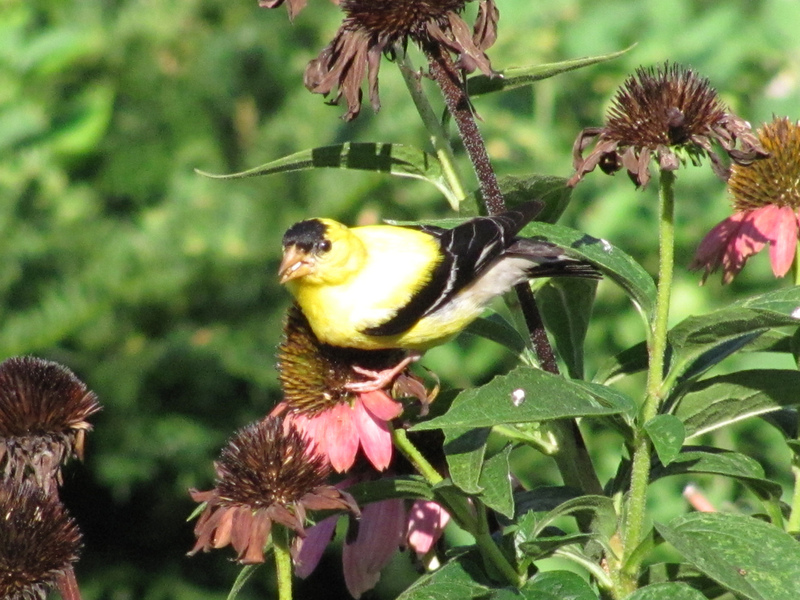 The abundance of coneflowers, asters, thistles and other plants that produce seeds in late summer and autumn, provide plenty of food for American Goldfinches to feed their young. Not having to rely on the warm-weather abundance of insects, allows the American Goldfinch to raise chicks when the insect population is declining for the winter. American Goldfinches nest from late July to the end of September. American Goldfinch (Carduelis tristis). Photo by Donna L. Long. These North American natives are vegetarians who eat mostly plant seeds and buds and some arthropods (insects and spiders) during the warm months. They eat mostly seeds and buds in the breeding season. Goldfinches like to eat these seeds while they are still attached to the plant not once they have fallen to the ground like sparrows and buntings. As the female incubates the nest the male feeds her regurgitated seeds. It is the female who feeds the chicks her regurgitated seeds during their first few days of life. After about four or five days, the male feeds the young directly. The male continues to feed the young for between fifteen and thirty days. He will feed the female after the chicks are born for about eleven days and then stop. The female often takes this as a cue to find another mate and start another nest. The male continues to raise the brood alone. American Goldfinches may raise up to two broods a year. Attracting American Goldfinches to your garden is as easy as putting out feeders with their favorite seeds, nyjer and sunflower. I keep my nyjer feeders well stocked, so I can see the little yellow birds in my garden. Of course native plants are the best food. You can try planting late summer and autumn seed producing plants such as asters (Asters spp. ), sunflowers (Helianthus spp. ), coneflowers (Echinacea spp.) , goldenrods (Solidago spp. ), vetches (Vicia spp. ), lupines (Lupinus spp.) and smartweeds (Polygonum spp.). Eating all those seeds makes one thirsty, so water also attracts finches. I keep a hanging water feeder in my garden, high off the ground to protect the birds from the hunting cats. 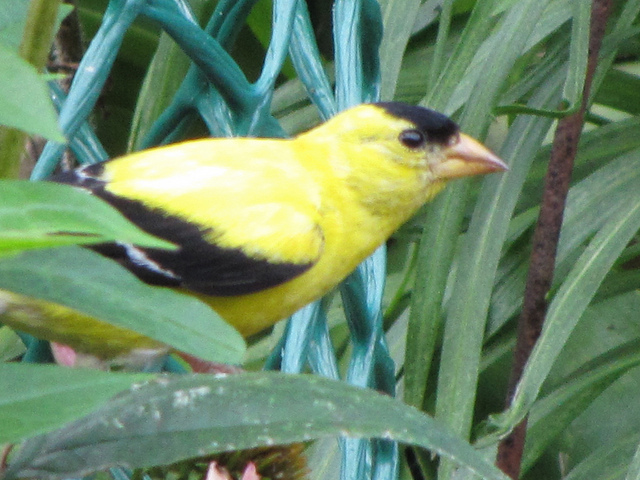 American Goldfinches are very easy to attract. They are happy gregarious little birds. A joy to have around. Their bright yellow color is so cheerful, just like them.